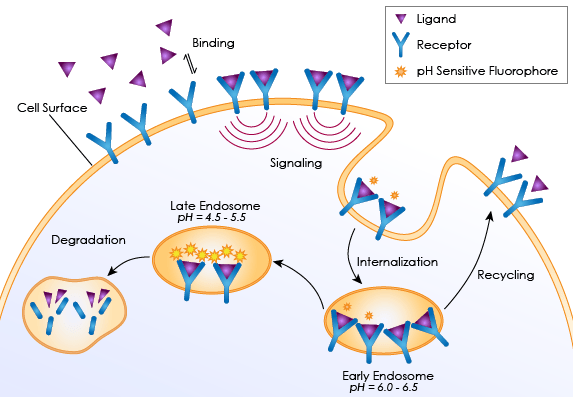 Receptor Internalization Assays measures the absorption of membrane receptors into the cell via endocytosis. The event is activated by the binding of ligand to surface receptors that signals the formation of plasma membrane-formed inward vesicles to enclose the target receptors (shown right). After the vesicles are formed and internalized, they are redirected to fuse with early endosomes (pH 6.0-6.5) that can recycle the receptors back to the plasma membrane, or they can be degraded via late endosomes and lysosomes (pH 4.5-5.5). Traditionally, receptor internalization can be qualitatively inspected via fluorescent microscopy to observe fluorescently-labeled receptors such as Fc and G-protein coupled receptors (GPCRs). Furthermore, western blot can also be utilized to quantify the level of receptor internalization. However, these methods are time-consuming and require experienced researchers to obtain meaningful results. By using the Celigo imaging cytometer, antibody or fluorescent protein-labeled receptors can be imaged and the fluorescent intensities of the target cell populations are measured to determine the level of receptor internalization automatically. Fluorescent images showed high % of receptor internalization of cells treated with Compound A. The green fluorescence occurs when vesicles of invaginated receptors are fused with late endosomes and lysosomes. The total number of cells are counted using the Celigo-captured bright field images, while the fluorescent images are counted to determine the number of cells showing internalization. The % internalization is then calculated by # fluorescent cells/total. Cells treated with Compound A showed high % of receptor internalization in comparison to the control Compound B. In addition, pHrodo fluorescence showed higher % internalization in comparison to Dylight-488. The Celigo imaging cytometer can be used to measure % receptor internalization via fluorescence detection. Phagocytosis is an essential process of the immune system to eliminate cellular debris and pathogens. It is a specific form of endocytosis involving vesicular internalization. Phagocytic cells such as macrophages can be attracted to pathogens or cellular debris and engulf the material to be trapped in an internal vesicle called phagosome. The phagosome would fuse with the lysosome to form phagolysosome, where enzymes and toxic peroxides can digest the pathogen or cellular debris at a low pH value. The host-defense activation of phagocytosis is by attachment of mammalian immune cells to Pathogen-associated molecular patterns (PAMPS), which can lead to NF-κB activation. Traditionally, phagocytosis can be qualitatively examined via standard optical microscopy to observe the engulfment of bacteria or cellular debris. In addition, phagocytosis can also be quantitatively measured by incubating phagocytes with particles bound with serum or IgG. After incubation, the excess particles are washed away, leaving only phagocytes with engulfed particles. These cells are lysed and release the engulfed material, which can then be examined by using microplate reader or western blot analysis to quantify the level of phagocytosis. However, these methods are time-consuming and require experienced researchers to obtain meaningful results. By using the Celigo imaging cytometer, phagocytosis can be measured using a pH sensitive label called pHrodo. The labels will only fluoresce when they are trapped in the phagolysosome where the pH values are low. Therefore, by measuring the amount of fluorescence or percentage of cells fluorescing, one can use the Celigo to determine the fluorescent intensities of the target cell populations and measure the level of phagocytosis. Fluorescent images showed high % of cells with Dextran pHrodo green fluorescence when treated with Compound A.
Fluorescent images also showed low % of cells with Dextran pHrodo green fluorescence when treated with Compound B, which is the control. The green fluorescence occurs when particles labeled with Dextran pHrodo are engulfed into the phagosome and fused with the lysosome. Cells treated with Compound A showed high % of phagocytosis in comparison to the control Compound B. The Celigo imaging cytometer can be used to measure % phagocytosis via fluorescence detection of Dextran pHrodo dye.